ORGANIZATION DESCRIPTION: American Prairie Reserve (APR) is building a wildlife reserve on the Northern Great Plains of northeastern Montana. The Reserve is designed for visitors around the world to experience spectacular wildlife and to protect one of the world’s most important and imperiled ecosystems. 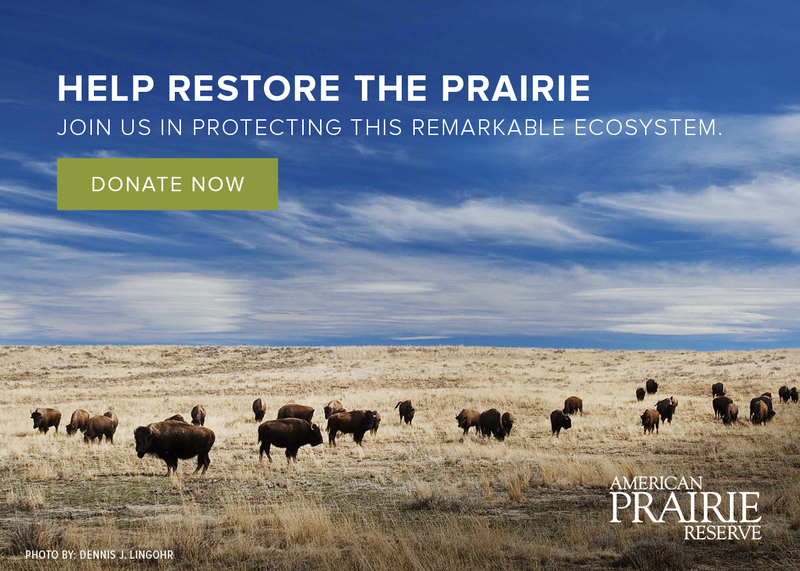 To date, American Prairie Reserve has assembled more than 400,000 acres of private and public land, reintroduced and managed a conservation herd of bison, restored wildlife habitat and opened recreation and education facilities to the public. JOB PURPOSE: American Prairie Reserve has embarked on one of the most important initiatives in its history­– creating the National Discovery Center. The Center will be the primary gateway and introductory point to the Reserve: a visitor center, a place to engage the community, and a destination that attracts people from around the country. American Prairie Reserve has purchased the historic Power Mercantile building in downtown Lewistown, Montana, for the Center’s future home, which will include a visitor services area and gift shop, conference and event pavilion, exhibition hall, immersive theater, children’s learning zone, and employee offices and conference room. The facility will serve as American Prairie Reserve’s main hub in Montana and will validate the organization’s commitment to preserving land and wildlife of historic importance, while also fostering social, cultural, educational, and economic opportunities. Joining American Prairie Reserve at a critical juncture in the National Discovery Center’s creation, the Center’s Director will assume responsibility for ensuring the full vision for the Center is realized by guiding and managing the design and construction processes of the facility and all of its components, and confirming and managing the Center’s programmatic content, outreach, and partnership opportunities. Once the facility is open to the public, our ideal candidate will have the skills, abilities, and desire to transition into assuming responsibility for general and fiscal leadership and management of the Center, including its programs, partnerships, budgets, and external relations. Leading the finalization of the themes, design, floor plan, and space applications in collaboration with a team of staff stakeholders. Identifying and hiring contractors for building construction/modifications and exhibit design and fabrication. Managing all components of the budget. Serving as primary point person to review plans and effectively communicate modifications, both internally and externally, with a variety of stakeholders. Establishing and maintaining clear, accurate, and timely communications with the goal of effectively resolving problems and engaging with a wide spectrum of professionals. Reviewing, seeking internal stakeholder approval for, and finalizing exhibit content provided by contractors. Develop short- and long-term programming plans– including identifying, securing, and/or managing partnerships with national, statewide, and local organizations and civic groups– pursuing and confirming programmatic content consistent with APR’s mission and the Center’s purposes, and developing marketing plans for these activities and events. Plan for the Center’s opening and ongoing operations by refining the operating model and designing the staffing and volunteer structure. Support fundraising efforts through the engagement and cultivation of donors by serving as the project expert and working closely with development team and Board of Directors. Serve as a representative of American Prairie Reserve in the Lewistown community, building relationships with local stakeholders, building APR’s positive reputation, and ensuring the Center provides economic and social benefit. Lead the process of identifying best practices for leveraging technology to expand the Center’s audience reach. Manage and execute the Center’s short- and long-range strategies and plans and take full responsibility for all operations, including staffing, budgeting, building maintenance and management, and integration of the Center into APR’s overall administrative processes and procedures. Communicate and work effectively with many constituencies: visitors, students, event participants, funders, school and civic organizations, and local and state government. Drive marketing and local, regional, and national awareness of the Center, its programming and its resources through digital, print, and media channels. Set and maintain the highest standards of program excellence, and design and execute comprehensive and compelling programming plans. Enthusiasm for and positive representation of American Prairie Reserve’s mission, values, goals, and culture. Project manager extraordinaire with ability to work effectively under pressure; effectively handle multiple project aspects simultaneously; demonstrate good time management and prioritization skills and accountability to firm deadlines. Extremely organized and productive with high accuracy and attention to detail. Outstanding leader with exceptional program and people management skills and the ability to articulate a vision and effectively accomplish deliverables and drive results. Resilient and engaging with savvy interpersonal skills. Strategic and competent oral and written communicator with assertive and proactive approach; articulate and poised with strong presentation skills and a positively engaging public presence. Savvy interpersonal skills to successfully build and maintain positive and effective relationships across a broad spectrum of constituencies. Highly competent in working with and enabling high performance from contractors, vendors, volunteers, and staff with strong collaborative skills and ability to contribute to a team environment. Demonstrated success in leading significant projects or programs with effective oversight, adaptability and versatility. Proficient with current technology devices and software including cloud-based software. Able to work a variable schedule, including weekends, evenings, and travel as the job deliverables demand. Valid drivers license, reliable transportation, and ability to drive. Knowledge, understanding and familiarity with state of Montana preferred.